I needn’t have worried, for 5 of my 6 classes it was very hot and fans were needed, the 6th was merely hot and overcast. I’ve always liked fans, one of the first things you get to make with paper as a child, so simple and at the same time effective. However I wanted to do something with the residents that was a little more “fancy” than just a folded piece of paper. 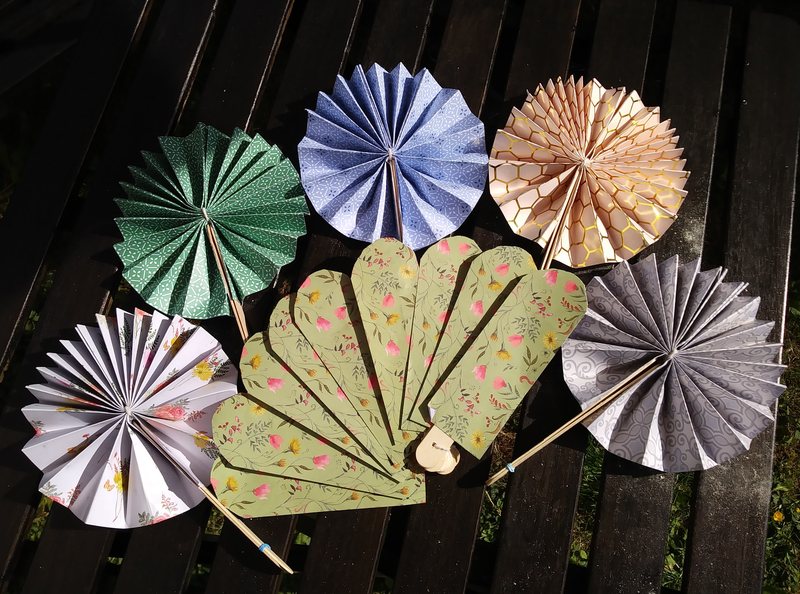 I did the usual bit of googling, and found 3 different ways to make fans, all with paper & lollipop sticks. The first a Traditional Fan using option 3, what wiki-how called a craft stick fan. I didn’t use photos, it was hard enough using patterned craft paper without trying to line up a picture. The lollipop sticks were fastened together with string at the bottom hole THEN it was the tricky bit of threading the top part together so that the fan could open and still overlap but also close completely. It kinda worked, but I knew there was no way I could ask the residents to try it. So the next option is what I would call a Lollipop Fan. As I was using 12 inch square craft paper, I cut each square in half and then glued the strips together to make a strip roughly 6 x 24 inches. Next is the standard fan folding, slightly harder as this was craft paper rather than wrapping paper but it will make the final fan more robust. Once folded, the fan is secured in the centre with either string or in the sessions with embroidery thread. It is then folded in half lengthways and the inner edges glued together so that when it is fully open it forms a circle. After that we’re nearly done. All the fan needs now is two lollipop sticks on either side to form handles. Another generous application of Pritt stick and a couple of handy loom bands to hold everything in place and done. After a few attempts I realised I could add the sticks in the first folds of the fan, and also use the holes in the sticks to add embroidery thread loop which could be wrapped round to hold the fan either open or shut. The knack is not to position the stick too close to the centre as it can tear the paper when you open and close the fan. I can’t do much about those who think the project is too simple but I can provide alternatives for those who struggle with the folding. So I went back to the drawing board for the third option a Paddle Fan. It’s option 2 in the wiki-how linked above, but I did it slightly differently. Rather than cutting two separate circles and matching them up, I used my precut 6 x 12 inch strips. I folded the strip in half right-side to right side, and then cut round a pre-made template I’d ransacked my kitchen unsuccessfully for something 6 inches in diameter so used a bigger plate to “round off ” the corners of the square instead. The it is simple enough to turn it the right way round and with a liberal application of Pritt stick secure a handle.